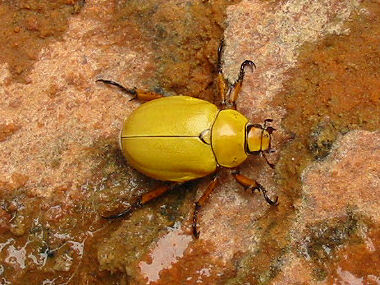 Cotalpa consobrina is a a member of the Scarab Beetle Family, a large family of more than 30,000 species that has some of the most colorful beetles in the insect world. Cotalpa consobrina is closely related to the goldsmith beetle. They grow to 1.5 inches in length and are a spectacular golden yellow with iridescent blue/green toe tips. The Shining Leaf Beetle at right was photographed in Grand Staircase Escalante. Female beetles deposit eggs in rotten wood which hatch after a few weeks. The larvae eat the decomposing wood. As adults, the beetles feed upon foliage of trees such as cottonwood.